The Mercedes-Benz F 015 Luxury in Motion automobile of the future shows how the car is changing from being a means of transportation to a private retreating space, said German automaker Daimler AG at the International Consumer Electronics (CES) Show 2015 in Las Vegas, Nevada. The F 015, currently a research vehicle, offers maximum space in an interior that resembles a lounge. Mercedes-Benz says the state-of-the-art vehicle elevates luxury and comfort to a new level. One key aspect of this vehicle is the continuous exchange of data between the car, the outside world and its passengers, says Daimler, the German multinational automotive corporation that owns Mercedes-Benz. Daimler researchers say the F 015 Luxury in Motion is Mercedes-Benz’ visionary answer to a fast-changing world. The number of cities with populations exceeding 10 million people will increase from about 30 today to more than 40 in 2030. 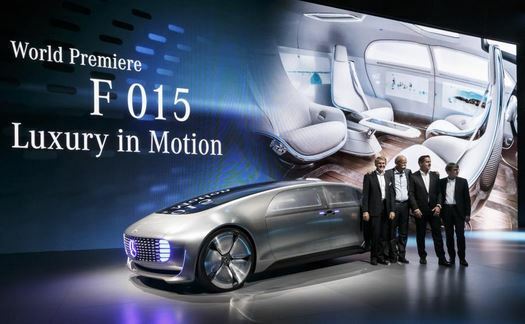 Photo: “World premiere Mercedes-Benz F 015: Luxury in Motion,” Daimler AG. When making the step from a self-propelled (automotive) to self-reliant (autonomous) car, Mercedes-Bens says one needs to go further than considering the technical aspects of automated driving. You have to take into account the people inside and outside the car, the company said. Any major milestone in personal transportation has an impact on society as a whole. In the interior of the vehicle, its four seats can rotate so that passengers can either sit face-to-face, all looking forward, sideways, backward, or in different directions. Passengers can use their time to chat, relax or work. The electrically powered seats swing outward by thirty degrees when the doors are opened, thus making it much easier to board or get out of the vehicle. The car has six display screens that have been harmoniously integrated into the instrument panel and the side and rear panels. The researchers describe the interior of the F 015 Luxury in Motion as a “digital arena”. This Mercedes-Benz video explains how the F 015 Luxury in Motion research car offers a vision of autonomous driving in the future.